The Pullman Standard built the National Embassy for the Union Pacific Railroad in early 1956. This car was built to run on the passenger train City of Saint Louis, which as co-operated with the Wabash Railroad. These trains ran between Saint Louis, Missouri, and Los Angeles, California. Union Pacific has 12 of the National Series, and the Wabash Railroad had 3. In the late 1960's, the City of St. Louis train was cancelled, and the UP Nationals were looking for a new usefulness. The Nationals saw some use on the Union Pacific Portland Rose, and the Union Pacific ski train to Idaho. By the fall of 1971, all the 12 Union Pacific National cars were auctioned off. The Pacific Railroad Society won the bid for the National Embassy. Due to the lack of serviceable wheels, the society never used the car in any service. In early 1978, William Gawzner, who owned the Miramar Hotel in Montecito, California made the Pacific Rail Society an offer they could not refuse. Mr. Gawzner owned an ex-SP Shasta Daylight car, which he wanted to trade for a sleeper car. Since the Pacific Rail Society already owned another National Series car, which had serviceable wheels, the decision was made to trade the two cars. For many years, the National Embassy was open on Sunday's in the parking lot of the Miramar Hotel in Montecito for public tours. Unfortunately, in 1984, Mr. Gawzner passed away. The car was virtually neglected from 1984, until 2000. After the passing of Mrs. Gawzner, and with the new owners of the Miramar Hotel looking to remodel the hotel, a new home was sought for the classic Pullman sleeper. With the help of society member, Larry Jennings, the car was donated to the Santa Clara River Valley Railroad Historical Society. 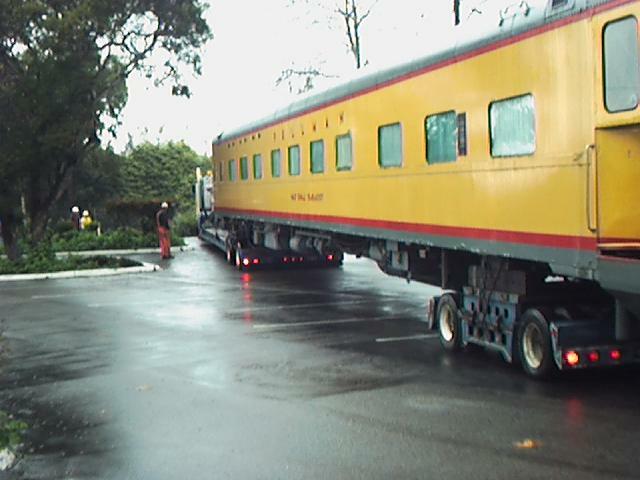 On February 16, 2000, the National Embassy was hoisted from it's 22 year home, onto a truck, for a ride to it's new home, Fillmore, California. Click here to see photos of this move, taken by society member John Gartman. Since it's arrival, some carpet has been replaced in the hall, and several windows have been replaced, but the car is in near original condition. In the near future, the car needs places in the roof repaired, and an exterior paint job. In balance, this car is an excellent addition to the Santa Clara River Valley Railroad Historical Society's collection. Also provided, where available, is information about where the cars are. National Homes (Wabash) May have been scrapped about 1971 by Steelmet Inc.
National Unity (Wabash) May have been scrapped about 1971 by Steelmet Inc.
Click the image above to visit the National Embassy Photo Page.